Woodwind instruments are all over the world, and the variety of them is awesome. You can see them in the most singular shapes, sizes and colors, different sounds and playing techniques. One of the highlights of this spectrum of instruments is the variety of origins where they come from, and the ethnic groups that use them. We have prepared a short list completed with some of the ethnic woodwind instruments that seems to us that can be interesting for the people to know. Associated with Lao and north eastern Thailand (Issan) cultures this bamboo made mouth instrument is mostly used in one of the most profusely listened, danced, and enjoyed kinds of music of the area called “Mor lam”. The bamboo pipes are united by a void hardwood container in which the air flew across. Even though the link with Lao culture is the strongest, several similar instruments are also used in music that comes for example Thailand, Cambodia and Vietnam. A Khene’s feature that stands out on its own, is the silver or brass made free reed that has connection with some western instruments with the same characteristics like the accordion, harmonium and concertina. Some of the uses of the instruments that can be highlighted are, the aforementioned “Mor lam”, “Dio Khaen” (solo), and “Ponglang” group. The instrument is an ancient vessel flute, constituted by an enclosed area formed by a mouthpiece and between 4 to 12 holes in its frame. Even though nowadays is made from many materials, like wood, plastic, metal, glass and even bone, the ancient manufacturers of the instruments used to utilize clay as their main raw material. Coming from an ancient family of wind instruments evidence suggest that the instrument has been with us for several hundreds of centuries. There is a great number of cultures in which these kinds of instruments have been influential ,and a good example of this phenomenon is the prominent part role that have played in the dance and song history in China, or the part that they took in the evolution of music in the Mesoamerican cultures. The Cortés’ and several other excursions were the responsible of taking the ocarina from Mayans an Aztecs cultures to the elites of Europe which adopted it as a toy instrument. The little goose (Ocarina meaning in Bolognese dialect) finds its origin in the 1900s, in the Bolognese town of Budrio where Giuseppe Donati, a local brickmaker converted a basic musical toy in the first classical ocarina. Originated in Armenia and also popular in some countries of the Caucasus and the Middle East, this double reed instrument shows in some way a similar sound to the English horn. The existence of the Duduk has been present from at least 15 centuries, and the length of it varies according to the region in which is founded. 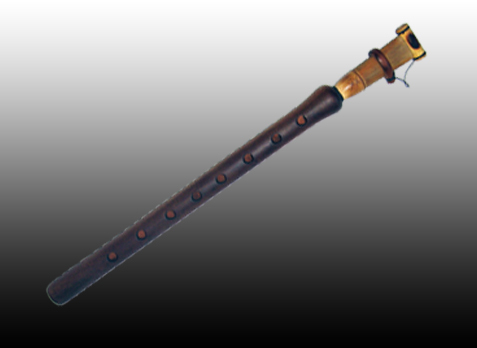 Made of apricot wood, the instrument is played in duos and stands out because the reed is very big in comparison to other instruments of similar features. Also another singular characteristic is that the instrument is wider than other double reed instruments, which makes the Duduk to have a unique sound, which requires special breathe abilities . In 2005 UNESCO declared the Armenian instrument as a Masterpiece of the Intangible Heritage of Humanity. This reed instrument has its origin in Cataluña Spain, and is also called grall de pastor. Member of the Shawn family of instruments the Gralla descend from a medieval instrument named xeremia. The main use in the ancient days was to advice the builders of the towers of castells the advance of the work in the structure, for which they used different melodies that helped the workers that were inside of the towers to be aware of it. These melodies were called toc de castells and normally the Gralla was used accompanies of a percussion instrument, preferably timbals. There are 2 kinds of Gralla .The Gralla seca, that beyond to be the most traditional and basic, is characterized by the noisy sound that produces. And the Gralla dolca that with its more subtle sound shows a longer length and features one or more metallic keys that contribute to the sweeter outcome that is recognized for. Used extensively by ethnics groups from Vietnam,the Dan Moi is a traditional instrument from the area which for many people resemble the jaw harp. Apart from external similarities the instruments differ in that for example the Dan Moi is executed against the lips, and not against the teeth like the jaw harp. This feature gives to the performer the freedom to manipulate the size of the oral cavity to manage the degree of volume that is necessary to use in their performances. The instrument consists of a section of brass fastened to a decorative bamboo box by a cord. Featured in the in the Ancient Indian text Natya Shastra, the Bansuri is a side blown flute which is one of the most characteristic of the Hindustani classical music. Made traditionally from bamboo, normally displays six or seven holes, being the regular dimensions between 12 and 30 inches long. In one end is closed and next to the other end shows blow hole.The instrument has also strong links with ancient Indian history and religion. Beside to be present in a huge amount of temples and reliefs, the Bansuri is considered the Lord Krishna sacred instrument having important connotation in the romance between Krishna and Radha. The way that the instrument is played is holding it horizontally towards the right side of the player. The external holes are closed by the ring finger, index finger, and middle finger respectively and the remainder of the holes are covered for the same fingers of the opposite hand. The different octaves are reach depending on the intensity that the air is blown inside the tube across the airhole that is kept next to the mouth. The little finger and the thumb are used as a support by the players, which allow them to get an appropriate position to execute the musical pieces. This instrument is characterized by being the tiniest one of all the Chinese flutes. Invented by master Yu Xunfa, koudi was originally made from bamboo but in present days can be found made out of another kinds of wood or even PVC. Prehistorical instruments were inspirational for Yu to invent the Koudi which in the first stage contained only one octave. Overtime and after to be presented in public, the master upgrade the original Koudi making a new one that displayed 5 holes. Nowadays the instrument presents 2 types, The smallest that is about 5 to 6 centimeters in length and the longest one, that is 8 t0 9 centimeters and shows between 2 to 4 extra holes. Being around for some 7000 years the Xun is a round flute from China that is recognized for being one of the most ancient instruments in the country. Typically made from clay, the origins of the instrument have been traced to the Stone Age. Linked to ancient Chinese hunting customs in which ancient hunters used to tie hollowed balls to a string that make singular noises when threw in the air. Curious about the origin of the sound persons started to blow air across the holes developing new sounds that gave the origin to the instrument. Between the ancient instruments that has been found it is a three finger hole one dated to the days of the Xia dynasty, and even the most of the Xun have 5 holes, it is little doubt that the instruments were related. The responsible for the standardization of these similar instruments was the Shang dynasty, and later by the time of the Zhou dynasty the Xun was seen often in festivals and more informal occasions. Often labeled as a wooden trumpet this 1.500 years wind instrument was created by ancient native of northern Australia. Even though there is no certainty about the age of it, evidence appeared in cave paintings and especially in a clear rock painting from the freshwater era in Ginga Wardelirrhmeng suggest that the origin can be dated about the beginning of that era. In modern days the instrument displays a tubular shape, and most of them have a length of about 4 ft.
Back in the day the instrument was played mostly in ceremonies, but was also common to see the Didgeridoo performing only for entertaining motives. Today the instrument is played in shows and festivities around the world, but for the indigenous from northern Australia it is still a basic components of their ceremonies and rituals. The most symbolic flute of the Andes, can be manufactured of timber or cane, is open in one end and in the other end is semi closed. Also shows 6 holes plus another thumb hole at the bottom. The sound is produced by closing the top of the instrument with the area between lower lip and the chin of the player. The Quena is used commonly by the indigenous of the region and lately by contemporary groups that played modern music inspired in ancient musical pieces of the region. Pi is a variety of instruments used in the Thai traditional music Piphat which is an group kind of music that uses wind and percussion instruments for its execution. The most important feature is that the instruments are quadruple reed. Between the most popular Pi we can find, the Pi Nok that has been used for very long time, Pi Nai which appears in literature works like the Phra Aphai Mani, Pi Chawa that is a longer Pi that consist in two pieces, Pi cha nai which which influenced by the Indian shehnai, has been dated to the Sukhothai era. 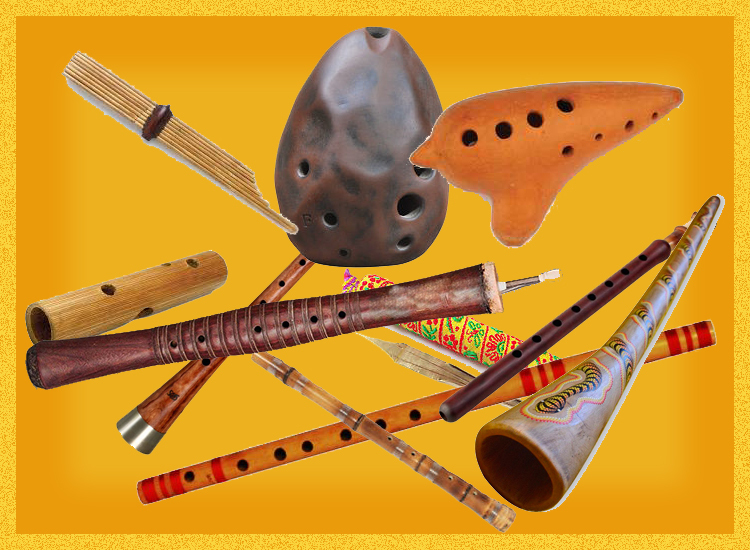 Ethnic woodwind instruments is an exiting topic to explore, and this is only a small sample of the amazing variety that ethnics groups has to give us. No matter where in the planet, these instruments appear everywhere and in most of the cases has been with the human been for very ancient days. The richness and colorfulness that they give to the ancient and also contemporary music is immeasurable, and with no doubt the lovers of most of kinds of music will appreciate the huge contribution that they have made to the music.